It is no secret that my hometown (‘Hell-A’ or ‘Smell-A’ as we call it around here) is not my favorite city in the world. Fortunately, the person I like to visit with the most often (my mom) makes the trek northward to see myself and my siblings every few months, so there is seldom a pressing reason to have to subject ourselves to the hideous smog, traffic, and shallowness of that vast, gray wasteland. There are a few things that I enjoy doing down south, so on our occasional jaunts I try to show Jay the positive aspects: hikes in Topanga State Park, walks on the Malibu beaches, bumming around Santa Monica, Shakespeare plays at the Theatricum Botanicum, and a recent favorite, having Sunday supper at Lucques. If I could airlift one restaurant from LA and plunk it down in SF, it would be Lucques. The vibe is decidedly un-LA, with rustic brick walls, a warm cozy feel, unpretentious staff and clientele(!) and the only locale we found down there that purveys locally crafted micro-brews. In fact, Lucques’ down to earth food and convivial atmosphere remind me of a laid-back Chez Panisse, Delfina or Zuni, without the self-conscious priggishness of many Bay Area eateries. The first evening we dined there was preceded by a stressful situation during which, after being stuck in the infamous traffic for nearly and hour, I desperately needed to use a toilette. Being over an hour early for our reservation, we set out to find a bar or cafe near the Melrose vicinity. After what felt like a desperate eternity of walking around (being gawked and pointed at from many Hummers and SUVs), we finally found one: an LA-sized Starbucks that would certainly have a restroom. Legally, they had to. Or so I thought. I gratefully ordered a drink, then asked to use the facilities, only to be told that it was for employees only. I threw a small tantrum during which I self-righteously declared that I would never, EVER, return to LA (Jay practically did somersaults of joy). Then I left my americano with an irate Jay grumbling about the lack of electrical outlets for his laptop, and went around the corner to a dodgy looking middle-eastern restaurant where I purchased a bottle of water in exchange for the great honor of using the ladies’. We arrived at Lucques and smacked ourselves on the forehead when we saw the gorgeous bar that we could have been sitting at, sipping Craftsman brews, all along. Luckily, the evening took a turn for the much better with the calming atmosphere of revelry and delicious food and drink. The aura of Lucques on a Sunday night, which I’ve now gotten to experience twice (the previous tantrum faded to a distant memory after the incredible meal), is one of casual luxury, rustic sophistication, and convivial Angelenos who can’t seem to believe their luck. And why would they? Each meal begins with a dish of roasted and salted almonds, lucques olives, sweet butter and the best house-made crusty bread I’ve ever had (yes, even better than Acme and Tartine. Put together. Seriously.) A reasonably priced, well-paced, three-course meal follow, the dishes comprised of classic but original combinations, impeccable farm-fresh produce, and sustainably raised fish and meats, which you can wash down with a glass of wine or locally-brewed beer. All in all, it’s a pretty sweet deal, if you can stomach the surroundings. Fortunately, you can enjoy a Lucques meal without having to experience the stifling air, crazy drivers and fake breastedness of its location. Suzanne Goin has transcribed dozens of meals into a gorgeous cookbook which captures the spirit of the restaurant in every eye-popping photograph and drool-inducing menu. 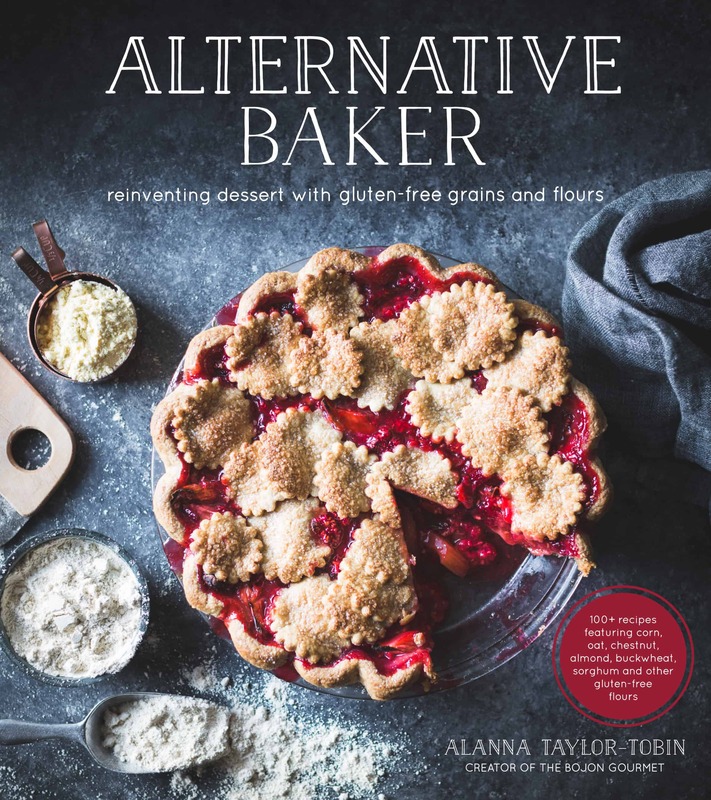 One of the things I have come to enjoy about this book is that you can take a single component from a dish and use it in a different way. 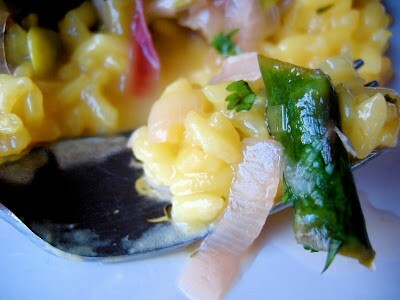 This saffron risotto comes from a meal of veal osso buco served with peas and pea tendrils. A box full of spring vegetables inspired me to serve a ragout atop the risotto instead of the meat (uh, not that the veal was ever really an option), and I now make this dish every spring when the variety of vegetables hits its stride. Though requiring a few different components (stock, rice, vegetables) the dish is simple to put together, pretty to look at, and captures that feeling of laid-back elegance that Lucques effortlessly transmits. The saffron adds just the right touch of mysterious flavor and dazzling color without tasting medicinal or overpowering. The trimmings from the vegetables go into the stock for the risotto, milking every last bit of flavor from the precious veggies. A dusting of parmesan gives the dish an extra burst of umami. Another bonus to making any risotto are the crispy, pan-fried cakes you get to make with it the next day. Risotto doesn’t reheat that well, as the leftover rice absorbs all the extra liquid and loses the firm texture of the individual grains of rice. But pat it into cakes, dredge it in flour, egg, breadcrumbs and pan-fry and you have leftovers that I wouldn’t hesitate serving to even Suzanne Goin herself. She’d have to come here, though. This delicious risotto is perfect to serve at a dinner party. Servings: 4 to 5 main course servings. 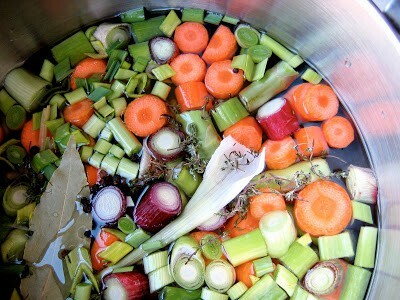 Combine the stock ingredients in a large stock pot or dutch oven and place over high heat. As you prepare the veggies for the ragout, add the cleaned trimmings from the spring onions or leeks, green garlic, asparagus, the pea pods, and any other vegetables you decide to use. Bring the stock to a boil, then reduce the heat to medium and let it simmer for 20 minutes or so. Strain into a large bowl or measuring cup. Next, begin the risotto. If the stock has cooled, heat it to a simmer in a large saucepan. Place a large skillet over medium-hight heat. Add the saffron threads and heat, shaking the pan, for a minute or two until the threads are dry, brittle and fragrant. Swirl in 2 tablespoons of the butter, then add the onions, thyme leaves and 1/2 teaspoon salt. Cook over medium heat, stirring occasionally, until translucent, about 5 minutes. Add the rice and 1 teaspoon of salt, and cook, stirring constantly, until each grain of rice is translucent with an opaque pearl in the center, about 2 minutes. Add the wine, give it a stir, and let the wine evaporate. Now begin to add the stock in 1 cup increments. After each addition, give the mixture a stir, and cook at a bare simmer until most of the liquid had been absorbed. You don't need to stir it continuously, but do stir it enough to keep it from sticking to the bottom of the pan, making sure to reach into the corners (I find the flat wooden paddle in the pictures above to be the perfect tool). Continue in this way until the rice is tender to your liking, 20-30 minutes more. (If you run out of stock, it's ok; just use a bit of water.) 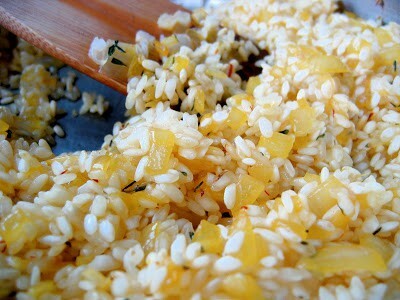 The grains of rice should be distinct with a thick and creamy 'sauce' coating each grain. 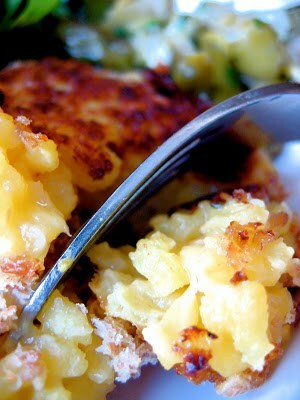 Stir in the remaining 2 tablespoons of butter and the parmesan and taste for salt. When the risotto is about halfway done, begin the ragout. Melt the butter and olive oil together in another large skillet over medium heat. Add the onions, green garlic and 1/4 teaspoon salt and saute until meltingly tender, 10 minutes or so. Add the wine, and cook until evaporated. Add the asparagus and enough stock to moisten, a ladleful or two, and simmer until bright green and crisp-tender. 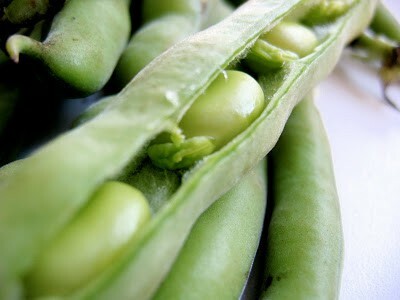 Add the peas and blanched favas and cook for another 2 minutes. Remove from the heat, and stir in the herbs and lemon juice. Taste for salt and acidity, and add a grind or two of pepper if you like. 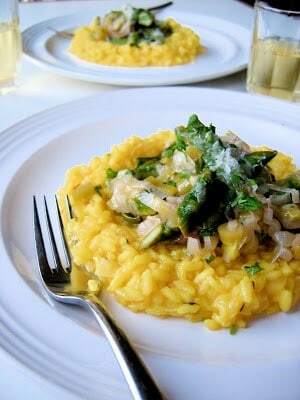 To serve, mound the risotto on large plates and make a shallow well in the center. Spoon the ragout into the well. Top with freshly grated parmesan and a shower of fresh herbs. Nothing is fast and hard about this recipe; use whatever veggies you want in the ragout. Nice additions could be fennel, baby artichokes, tiny carrots, turnips or gold beets, spinach or arugula leaves, mushrooms (especially fresh morels), and additional fresh herbs such as chives, basil, mint, chervil or tarragon. You could also put a slab of grilled or broiled fish atop the stack and drizzle with extra lemon juice, olive oil and a sprinkling of herbs. 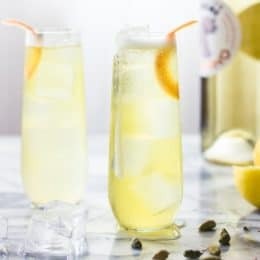 Either way, have a bottle of crisp white wine handy, such as a citrusy Sauvignon Blanc; you'll need 1/4 cup each for the risotto and the ragout; the rest you will need for drinking. 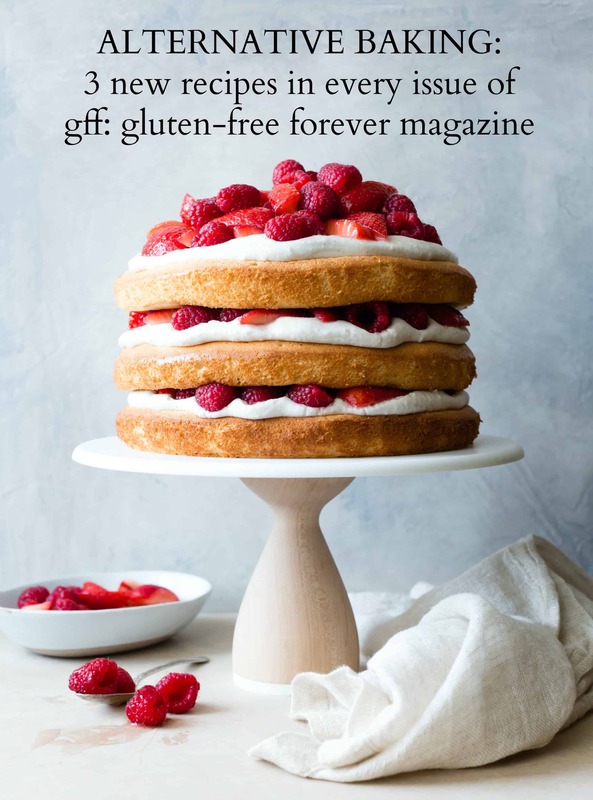 While I am bossing you around, I'd recommend starting your meal with a perky salad, having some crusty bread handy for mopping up ragout juices, and finishing the meal with something bright, like lemon balm ice cream or lemon-almond cake with fresh berries. 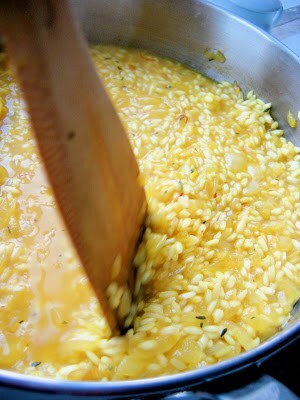 The risotto is best eaten when just finished, otherwise the rice continues to absorb the liquid and becomes overly soft. To get the timing right, make the stock and prepare the ragout ingredients first. Begin the risotto next, and when it is halfway done, prepare the ragout. Have your peas and favas shucked and your favas blanched and slipped before beginning the risotto and things should be ready to go at the same time. If you find your risotto is cooking too quickly, just turn it off before it is done, then resume cooking it when you are almost ready to plate. Place 1/4 cup flour on a shallow plate. In a shallow bowl, beat an egg (or an egg white) until homogeneous. Fill another shallow bowl with a cup or two of fresh bread crumbs. 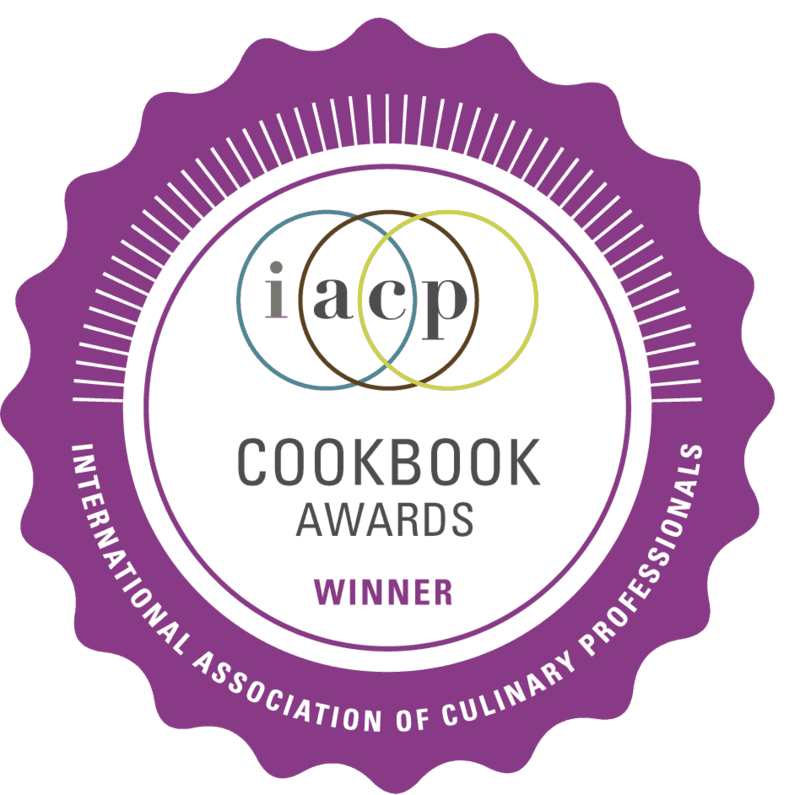 Scoop up 1/4 cup cooled risotto (a spring loaded ice cream scoop works well for this) and pat into a patty with moistened hands. 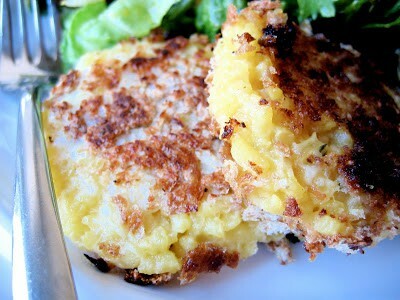 Dredge the patties first in flour, then egg, then breadcrumbs. Heat 2 tablespoons of vegetable oil in a wide skillet (preferably well-seasoned cast iron) and when it shimmers, carefully place the patties in the hot oil. Fry until browned and crispy, about 5 minutes per side. Serve with leftover ragout, a dusting of parmesan and a green salad if you like. 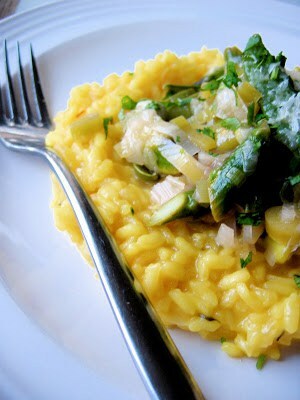 Risotto adapted from Sunday Suppers at Lucques. Nutritional values are based on one of five servings. Nothing is fast and hard about this recipe; use whatever veggies you want in the ragout. 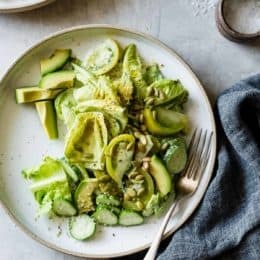 Nice additions could be fennel, baby artichokes, tiny carrots, turnips or gold beets, spinach or arugula leaves, mushrooms (especially fresh morels), and additional fresh herbs such as chives, basil, mint, chervil or tarragon. You could also put a slab of grilled or broiled fish atop the stack and drizzle with extra lemon juice, olive oil and a sprinkling of herbs. 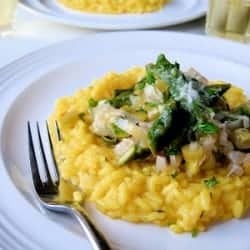 Either way, have a bottle of crisp white wine handy, such as a citrusy Sauvignon Blanc; you’ll need 1/4 cup each for the risotto and the ragout; the rest you will need for drinking. 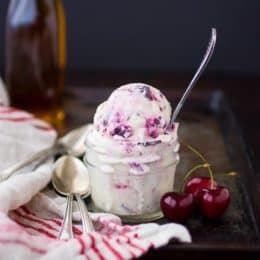 While I am bossing you around, I’d recommend starting your meal with a perky salad, having some crusty bread handy for mopping up ragout juices, and finishing the meal with something bright, like lemon balm ice cream or lemon-almond cake with fresh berries. Next, begin the risotto. If the stock has cooled, heat it to a simmer in a large saucepan. Place a large skillet over medium-hight heat. Add the saffron threads and heat, shaking the pan, for a minute or two until the threads are dry, brittle and fragrant. Swirl in 2 tablespoons of the butter, then add the onions, thyme leaves and 1/2 teaspoon salt. Cook over medium heat, stirring occasionally, until translucent, about 5 minutes. Add the rice and 1 teaspoon of salt, and cook, stirring constantly, until each grain of rice is translucent with an opaque pearl in the center, about 2 minutes. Add the wine, give it a stir, and let the wine evaporate. Now begin to add the stock in 1 cup increments. After each addition, give the mixture a stir, and cook at a bare simmer until most of the liquid had been absorbed. You don’t need to stir it continuously, but do stir it enough to keep it from sticking to the bottom of the pan, making sure to reach into the corners (I find the flat wooden paddle in the pictures above to be the perfect tool). Continue in this way until the rice is tender to your liking, 20-30 minutes more. (If you run out of stock, it’s ok; just use a bit of water.) The grains of rice should be distinct with a thick and creamy ‘sauce’ coating each grain. Stir in the remaining 2 tablespoons of butter and the parmesan and taste for salt. Great. It's 11pm and now all I want to do is make risotto. Thanks.